Tags: Angrakha, Banarsi Chiffon, Bridal, Brocade, Lehenga, Maxi, Pink, Red. Pinkish red angrakha style bridal maxi adorned with dull golden, antique shades of embellishment. Pure banarsi jamawar chiffon fabric has been used for long length maxi. 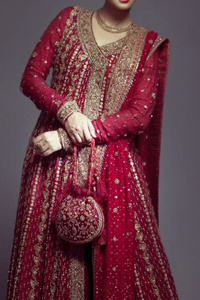 Brocade lehenga and pure banarsi chiffon jamawar dupatta. Maxi adorned with embellishments on all over it. Embellished border with pearls and sequence spray all over it. Dull golden, antique shades of embellishment.